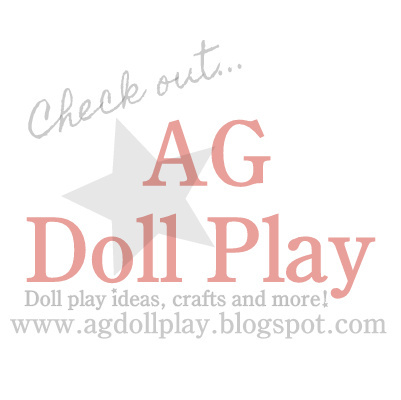 Hi, My name is Misty and I'm excited about sharing my doll crafting adventures here on the AG Doll Play site. I'll formally introduce myself, my daughter and our dolls soon but for today I'd like to share a very easy doll outfit I made. See, I'm longing for warm weather! As soon as the ground hog declared spring was on it's way I started dreaming of summer and the beach and thus a grass skirt and halter top was made for the dolls! Bring on a luau I'm ready. And the best part.... the only sewing required is for 1 button! 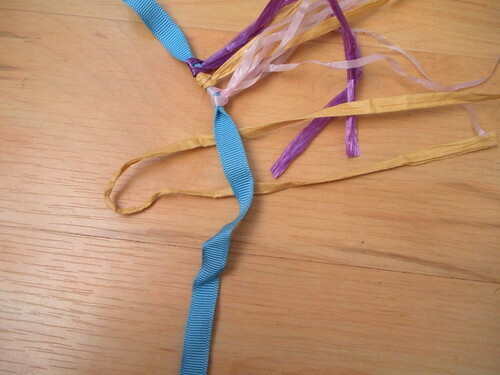 Step 1: Start by finding the center of your 24" ribbon. Place your first piece of raffia here. 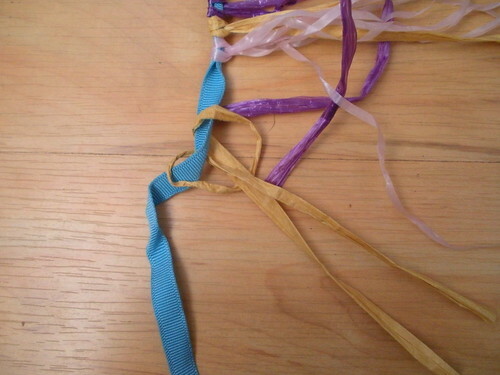 Do this by folding your 13" raffia strip in half. 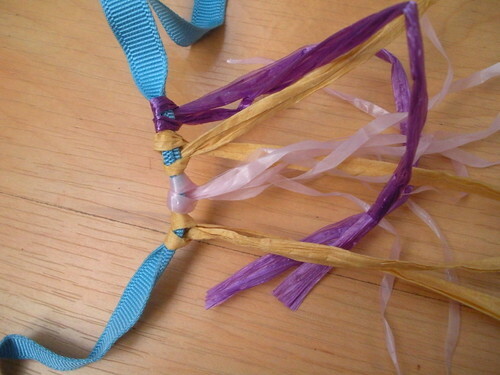 Lay you folded raffia down and place the ribbon on top like below. 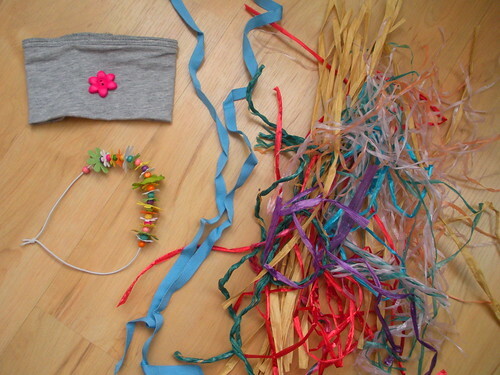 Step 2: You'll take the 2 ends of the raffia and slide them through the top portion. This creates a loop knot around the raffia. (See below.) Gently snug up the knot around the ribbon. Step 3: Continue adding raffia, working from the center out to the ribbon ends, until you've filled in about 11-12 inches of the ribbon. Step 4: Making the top. 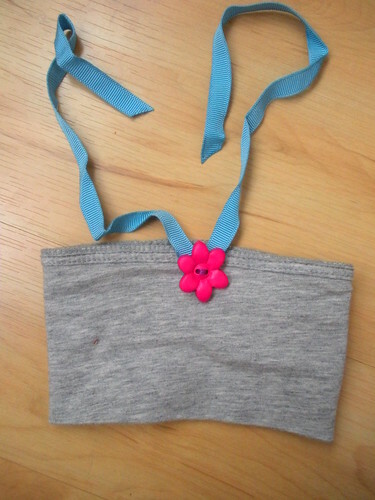 Cut off the cuff from a long sleeve t-shirt. Be sure to keep the seams in tact as this gives a nice finished look to the top of the top. 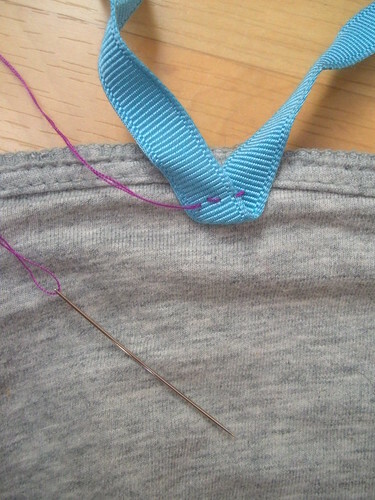 Step 6 : Sew on a fun button over the stitched down ribbon! 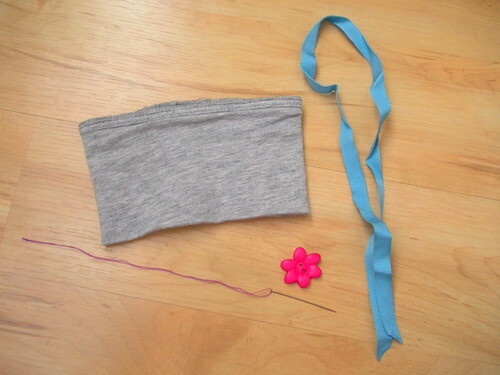 Step 7 : Make a "lei" by stringing flowers and beads on an elastic cord. I had colored wooden beads from the local dollar store and paper flowers from my scrapbooking stash. 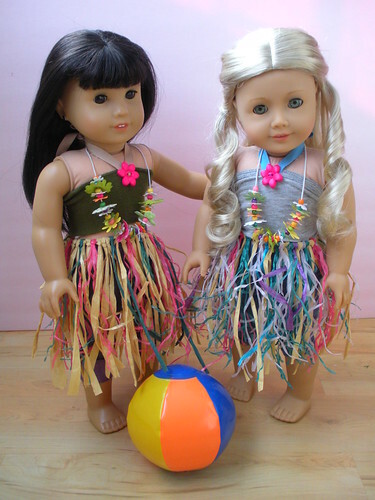 Dress your dolls and have a little beach time fun! It's still winter but I hopeful spring is on it's way. Thanks for stopping by and letting me share today. Very cute! Love it and I know my girls will, too! Yay! So happy that you love it and are going to try it with your girls too! If you are on Facebook, please share a picture of what you come up with when you are done. I made this outfit for my Kanani doll. She loves it! I made an bracelet for my Kaya doll. AND I MADE IT WITH BUTTONS AND A SOME YARN!!!!!!! My doll loves it!